Suranadi is located in the quiet cul de sac of Cavvanbah Street Byron Bay (off Milton St). The town centre is a 400 metre walk - no need for a car and Byron's paid parking. The homes are surrounded by tropical gardens and interiors decorated with a blend of modern and tropical furnishings. There is a living area on each floor with wide screen Digital TV and CD player. Upstairs king bedroom with TV. Downstairs queen bedroom and twin bedroom (single sofa bed on request). Ceiling fans in every room. Ocean glimpses from the upstairs deck and constant sea breezes. BBQ with outdoor table and chairs. Sun lounges in the secure and fenced backyard. Complimentary wireless internet, portacot & high chair, kids buckets/spades etc & beach umbrella. If your dates are not available please check our Suranadi Beach House # 1 listing. ALSO CHECK OUR SITE FOR LAST MINUTE DISCOUNTS OR SEND ME A REQUEST - I will always discount to fill a gap. Sorry - pets are not permitted on the property - except service dogs. The Suranadi Beach Houses are spacious and tastefully decorated with comfortable, modern furnishings. The three bedrooms (Beach House 2 has 1 x king, 1 x queen and 2 singles - additional sofa bed available on request. Each bedroom has a balcony or patio. There are two bathrooms, one with a bath and separate shower, the other with a shower room, each with separate toilet, hair dryer & fluffy towels. The kitchen features stainless steel appliances, dishwasher, microwave, cappuccino machine and granite bench tops. Laundry with washing machine, dryer, ironing facilities. Two parking spaces - one under cover - are provided. All linen is included. The architectural style of Suranadi reflects the blend of Australian and Asian influences that have become as unique to the Far North Coast as the many lifestyles that encompass the region. Roofed decks and patios for hot or wet weather. Large fenced secure yard with tropical garden. During low season each house can be configured to a two bedroom apartment. We purchased this property about 20 years ago and eventually built the new houses. Location, location, location. Its quiet but so close to town and over the dune to the beach. Hearing the surf all the time, taking an early morning walk along the beach, we love it! Only 1 step into the house with the downstairs containing 2 bedrooms and bathroom plus the kitchen and family room. Upstairs a king bedroom bathroom plus living area. 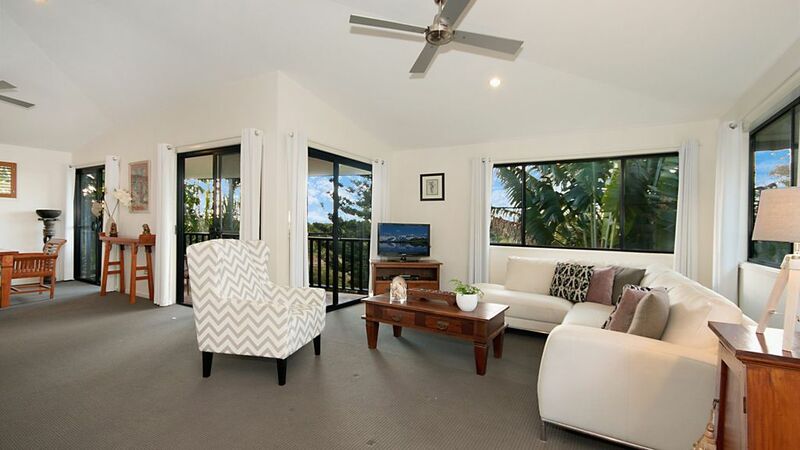 Good location in Byron with a short walk to the beach out the backyard. Town is also nearby without needing a car. If you do feel like driving, head to The Farm for breakfast! The house itself is functional with 2 bedrooms downstairs and 1 up. Upstairs also has its own living space and when you open the windows you can hear the ocean waves. Practical house, great location, nothing to complain about. We had a lovely break at Villa 2, its a peaceful location, yet a hop skip and a jump to the busy & colourful Byron town. Although we had requested 3 bedrooms with Queen beds ,we ended up with Villa 2 which had 2 rooms with Queens and one bedroom with 2 single beds. This still worked out a very enjoyable house which has great location benefits being so close to the beach and also only a short walk to the town centre for shops, cafes etc. We all needed a great break and that is what we were able to have at Suranadi Beach House Villa #2 . We were also able to pursue individual interests at various times because of this house's great location.We would recommend either of these 2 Suranadi Beach Houses to others. Thank you for your review. I have searched all correspondence and cannot find any request for 3 queen beds. Had I known I would have had the cleaner push the 2 singles together. I am pleased you enjoyed your stay. We stayed at Villa 2 and it was perfect for 4 adults and two kids. It was so so close to the beach and town we hardly used our cars. The lay out of the house was ideal and it had everything you needed. It was spotless and had a totally relaxing vibe about the place. Thanks for staying at Suranadi Liam. Would be glad to have you stay again.